This is where we keep an up to date list of our favorite art supplies. We’ve sorted the art supplies into some different categories to make it a little easier to navigate. 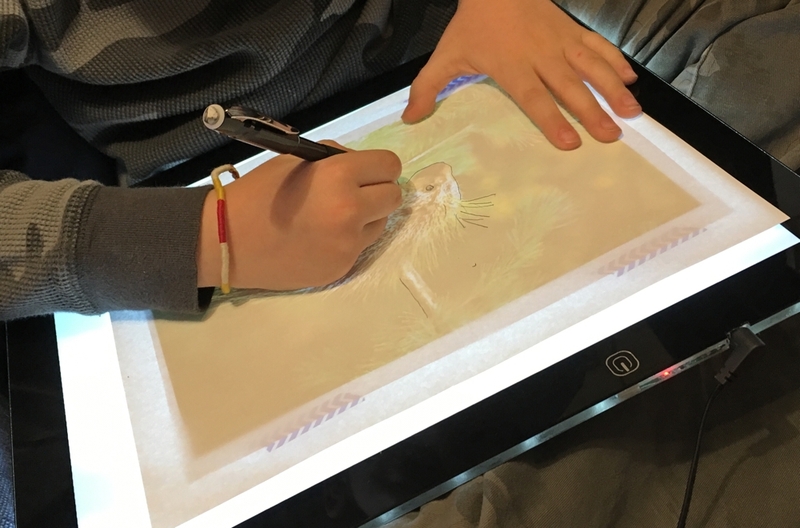 Light Pad– Dbmier Light Box/Pad $39.99- This is one of my favorite things for both younger and more advanced students so it probably should be on both lists! It’s easy to use, lightweight and has held up to a year of being hauled around in my kids’ backpacks! This one, for $25 is slightly smaller but works just as well! Watercolor Pencils– Fabber Castel Albrecht Durer ($38 for a 24 pack) – These are some of my absolute favorite art supplies! They are also sold in different sized packs, so buy what your budget allows. Travel Journal Sketch Book- I love Canson’s 138 lb Mix Media Paper Pad (Fine to Medium texture). This wire-bound pack of 30 sheets of 5.5 x 8.5 Inch paper is exactly what I’ve been traveling with this year. If I decide to add a bit of color with my watercolor pencils, it can still handle it (where the 24lb printer paper could not). However, it’s easier to sketch in than watercolor paper because it’s smoother. .